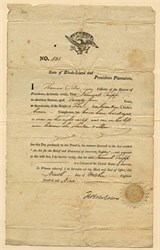 Rhode Island and Providence Plantations Seaman's Protection papers signed by Thomas Coles, Collector of the District of Providence issued to Samuel Tripp in 1809. This item has the signatures of Thomas Cole, and Samuel Tripp, and is over 202 years old. XF condition. The document is not attached to the manila folder in the scan. Thomas Coles was the son of an English Officer who was, stationed in Ireland at the time of his birth. At the age of twelve years he left his home in England, and as sailor on board a merchant vessel, came to thts country. Aftersome years he joined the army, serving to the end of the Revolution. He received a Commission as Ensign in the 4th Massachusetts regiment, September 29, 1779; also, as a Lieutenant in the Massachusetts Line, November 5, 1782. He always spoke with much gratification ot receiving a sword from General LaFayette. The General was reviewing the regiment of which he was a member and perceiving that his sword was broken presented him his own. The sword is at present in the possession of Frederic Hoppin, Esq., eldest son of Ex-Governor William W. Hoppin, of Rhode Island. During the latter part of the war. he was Aid-de Camp to General Patterson, receiving his commission from General Washington. After the close of the war he for some years sailed as Captain of a vessel beljngingto Clarke & Nightingale, of this city. April 27,1806, he received notice from the Hon. Albert Gallatin, Secretary of the Treasury, that the following gentlemen, William Latham, Thomas Coles, and Jonathan Price, Ksqs., were appointed Commissioners to survey the coast of North Carolina between Cape Hatteras and Cape Fear. Thomas Coles, in a letter dated Newbern. November 22,1801, to Richard Jackson, Jr., Esq., of Providence, It. I., says: "The business of the survey of this coast has been attended with many perplexing circumstances, a great deal of risk, and no small proportion of vexations. He received a commission as Commissary General of the State of Rhode Island, from Governor James Fenner, June 27.1S08. He was one of the original members of the Rhode Island State Society of the Cincinnati, and Treasurer of the same for many years. His appointment upon parchment of January. 1784, signed by J. Knox, Secretary, and George Washington, President, culls him; "Thomas Coles, Esq., a Captain in the late Army of the United States." He was Collector of the port of Providence from 1809 to 1829. He is pronounced by his contemporaries who still survive a gentleman of the old school, of commanding presence and elegant manners. History from the Proceedings of the Rhode Island Historical Society.